This 18-hole golf course offers a challenging round with breathtaking views of the Rocky Mountains. The front nine is a links style layout with mature trees lining the fairways and water coming into play on all but two holes. The back nine has several elevation changes with several sand traps to challenge every shot. 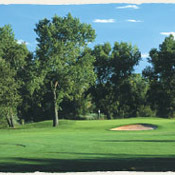 With four sets of tees, golfers of every ability can enjoy the course. Unlike many other Colorado golf courses, Coal Creek provides an incredible golf experience for every caliber of golfer while surrounded by breathtaking views of the nearby Flatiron Mountains. This Colorado golf course measures 7,028 yards from the back tees and 5,185 yards from the forward tees thus ensuring challenge and enjoyment for each and every golfer.